Regular price 395 pesos only. Available in shades for deeper skin tones: Mocha, Toffee, Fawn and Ginger* Formulated with PreciseLight Technology. ** Smooth velvet-soft finish. Great for on-the-go touch-ups. Includes mirror & sponge. .4 oz. net wt. *Formulas for deeper skin tones by celebrity makeup artist Paul Innis! As one of the most in-demand celebrity makeup artists, Paul has perfected the looks of many “A-List” stars and internationally recognized supermodels. His work appeared in top beauty magazines. And now he shares his treasured trade secrets with you. Paul has worked with the Avon color lab to develop an expanded shade palette...so now there’s a more precise match for everyone. **PRECISELIGHT TECHNOLOGY has innovative light-adjusting pigments, making your skin look natural wherever you are. According to jodee900 of reviews.avon.com "i bought the purple haze quad hoping the colours would be vibrant.i was amazed&i am so in love with these eyeshadows.my girlfriend loves the way my eyes look.i would so recommend this to anyone." erica1483 said that "I purchased the smokey eyes quad. I really liked the colors. They are very pretty. However, I agree with a lot of the other reviewers who are saying that the shadow is too dry. To remedy this, all I did was put a TINY amount of moisturizer or Magix face perfector on my eyeshadow brush before dipping into the shadow. This made the color very noticeable. I only did this for the lighter colors. It turned out very beautiful and I even have medium toned skin. Try it for yourself." Typhoonchick said "I've tried AVON eyeshadows before and have always been pleased with their quality. I purchased TRUE COLOR Eyeshadow Quad in Smoky Eye. They are very easy to apply and feel very smooth on your skin but I do wish the color itself was brighter and more intense therefore the name "Smoky eye" to my opinion is a bit misleading. Bottom line: if you're looking for a set of suddle eye shadows for everyday wear these would be perfect; but if you need to create a real "smoky eye" for a date night out or prefer more defined eye makeup for daytime - I would suggest going with something else." Precision pencil sharpens to a fine point. Won't tug or pull. According to Jillian Dempsey to apply the Ultra Luxury Lip Liner and to help lips speak volumes. First,apply lipstick, then line lips with a liner that matches your lip color. This makes lips look more natural and keeps color from feathering. The key to fuller looking lips and rich, lasting color: smooth, blendable liner that lasts up to 8 hours. Kettykatsrule of reviews.avon.com says that the neutral blends well with just about any color lipsticks. Neutral: A little bit orangey if you put it on thick, but just right if you use a light hand to apply. Works well with the Perfect Wear Totally Twig lipstick. Rosebud: Perfect for my fair skin tone. Looks a little more natural than the Neutral, so I can wear it with very sheer lipsticks or even a lipgloss (not a clear gloss, though). Shimmer Mauve: Good for a night look on my fair skin. Wild Berry: This has to be my favorite, though I probably won't use it as often as the rest. It's very.. Bold. But being a stay-at-home-mom, it's a little too bold. Maybe I'll use it when my hubby comes back from deployment and we can go out to dinner or something. It's a pretty color, though. But definitely more for night. And they all glide on smoothly (if they don't, it's probably b/c you didn't use a lip balm, and you should always use a lip balm before applying anything on the lips b/c it makes application much more smooth). And they wear for a good while before they rub off, too." ropegirl of totalbeauty.com/reviews says that "This lipliner goes on nicely and stays on for awhile. It sharpens easily also. It doesn't pull at your lips when applied and seems to not smudge or be drying". Avon Baby Soothing Oilmoisturizes and softens baby's skin without the greasy after feel. Babies sleep better when massaged with Avon baby soothing oil because it is infused. To use, apply a small amout on hand. Gently massage on skin. it smoothens baby's skin if used daily. In Avon's direct selling brochure this Avon baby soothing oil will cost you 159 pesos only. for your baby to have a smooth and beautiful skin. Bath time is one of the most difficult task in taking care of your baby. It is Avons commitment to makes womes life more comfortable. Avon developed this two in one Avon baby wash and shampoo. It makes bath time for babies both fun and easy using this baby Tear-Free and Head-to-Toe Wash and Shampoo. It is mild and gentle, perfect for cleansing baby's hair and body without drying baby's delicate skin. 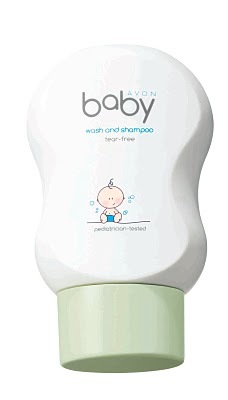 Avon baby Tear-Free Head-to-Toe Wash and Shampoo is tear-free and causes no irritation to babys eyes. In the Avon brochure for direct seller it cost 159.00 pesos only very affordable for budget conscious mothers. To use pour in hand or washcloth. Gently apply to baby's wet hair, scalp & body. Lather and rinse. Avon Baby Moisturizing Lotion keeps baby's skin gentle, soft and cuddly. It is lightweight and non-greasy and it is absorbed quickly by the skin, leaving skin feeling soft and smooth. It is dermatologist and allergy tested suitable for sensitive skin.the perfect product to care for your babies skin. It makes babies skin ever lovelier. in the Avon brochure for avon direct selling this baby moisturizing lotion cost you 159 pesos only. Avon baby products contains naturally-derived ingredients like vitamin E, soothing aloe, and calming chamomile. Avon Baby products are mild and gentle, perfect for babys special skin care needs. the Avon baby moisturizing lotion, Avon baby Soothing Oil and Avon Baby Tear Free Head-to-Toe Wash and Shampoo are hypoallergenic and free of parabensand dyes. These products are pediatrician-tested, mother-approved and baby-friendly. The Avon baby products comes in bottles that makes it easy for mothers to apply the products with one hand while hlding their babies in the other hand. Avon baby products are developed by experts who are moms themselves.